Realistically, this page should be left blank because so far, we are pleased to say, we have been unable to find any pictures of Giant Redwoods that have been felled by extremes of weather. The nearest we came to it was hearing that a certain John Redwood broke his wrist while clearing fallen branches from his garden! 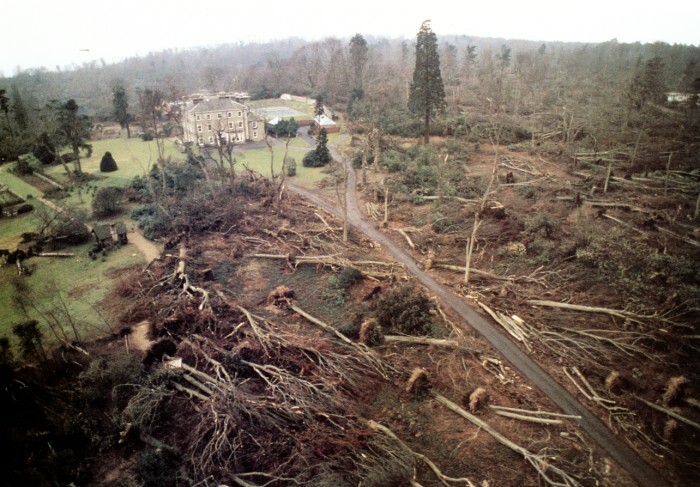 Nevertheless, it is interesting to see how the tree population in general was affected by extraordinary storms such as the Great Storm of 1987. Eighteen people died because of the storm, hundreds of were injured and around 15 million trees were lost. Yet national radio and TV weather broadcasts had not even mentioned strong winds by the time most people went to bed; technically Michael Fish was correct in stating that there would not be a hurricane, but gusts of wind certainly did reach hurricane force in strength during the night. Such freak weather conditions are extremely rare in the UK and, in fact, the last storm of similar magnitude occurred back in 1703. Although this was seen as a one-in-300-year event, similar weather was to follow in 1990 when another storm struck, a mere 27 months later! It has been difficult finding any details of Giant Redwoods that fell during the storms. This is not just because these trees are relatively rare; a close look at a good example of a Giant Redwood reveals the secret of their survival. Not only is the trunk wide, it also flares outward near the ground, thus giving a wider and more stable anchorage. As any physics student will tell you, this reduces leverage at the base. When researching the subject of storm damage, we have frequently encountered tales of Redwoods that have survived while others around them have been decimated. An excellent example can be seen in the pictures below. 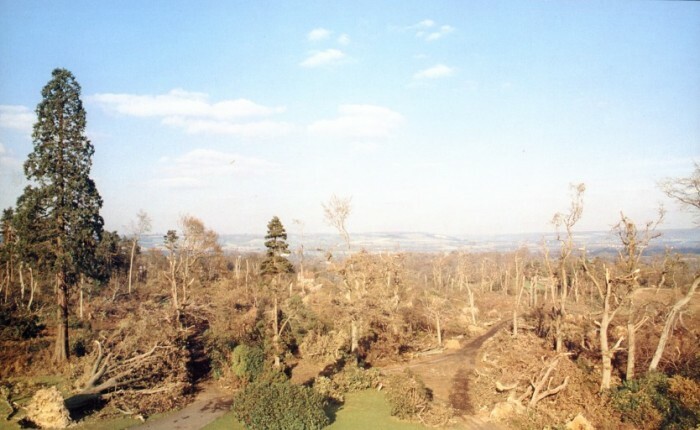 As you can see from the pictures, the area around the Giant Redwood was subject to immense gusts of wind which tore many trees from the land and wrecked most of the rest. Standing tall and self-righteous as though it had been sitting in a bit of a draft; The Giant Redwood! On 30th September 2011 a 1,500 year old pair of Giant Sequoia (Sequoiadendron giganteum / Wellingtonia) fell in the Trail of 100 Giants grove in California. The pair were joined at base for the first 30 feet. The result is 250-300 feet of 17 feet high trunk laying right across the trail. Several tourists managed to catch the event on video and you can see this on the Mail online website. One of the videos has a US Forest Service park ranger talking about the fall of the trees and describing the event and possible causes. They believe that the fact that it was growing between two creak drainages, and the very wet winter, caused the trees to topple due to the weight at the top. She also describes it as a once in a lifetime event, apparantly they just don't fall over very often! Lode - Anglesey Abbey The Giant Redwood is not invincible, however, since nature's arsenal holds a weapon far more destructive to it than hurricane force winds. Lightning. 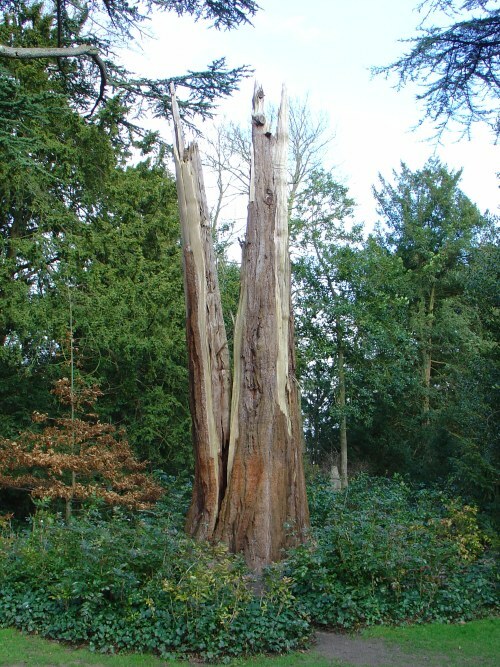 It is enevitable that Redwoods are vulnerable in this respect, due to their immense height - they will usually tower above surrounding trees and buildings and are likely be the first object struck in a thunder storm. This is not always catastrophic, as often the trees will just lose a couple of feet and recover after a few years. You may also see scarring near the base of the tree. The pictures (left and below) show just how devastating a really huge lightning strike can be. The trunk literally explodes as the electricity boils the sap in an instant. Even then, as the lower picture shows, the Redwood can struggle on with what is left of its branches and foliage. The one below, in Purleigh, was struck in August 2003 and although there was talk in council meetings of removal, it still stands today. We would be interested to hear from you if you have any information on Redwoods damaged as the result of storms or lightning.